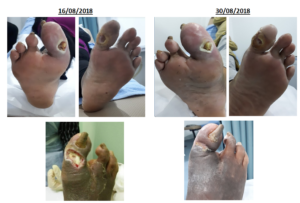 When we first met Puan Suhaiza (back in Aug 2018), she expressed that she has been suffering from Diabetes Mellitus for 20+ years and her 2 big toes had open wounds. Upon further examination, our consultants saw that one of her toes on her right foot had been amputated due to infection. She was taking antibiotics to manage her infections and she was also reliant on Insulin for her diabetes. She has to constantly visit the clinic to get her open wounds cleaned and treated. Upon starting the Hi-Bliss Hydrogen treatment, our Consultants had also advised her on dietary requirements together with advises on cleanliness and safety precautions to avoid any further mishaps that could result in open wounds. Upon Puan Suhaiza’s 7th treatment session, we observed that there was noticeable difference, as in the wounds were starting to dry up and heal. Even Puan Suhaiza’s son who always accompanies her for treatment was surprised. The wounds continued to heal and close up nicely (visible tissue forming) and by the 13th session, we had also noticed that Puan Suhaiza’s Blood Sugar/Glucose level had dropped from 20 mmol to 6 – 7 mmol.